By Magill, Frank M., James Kepner, editors, Pat Rocco, photographs, Elaine Noble, Burt Pines, Rev. Troy D. Perry et al. Hollywood: Christopher Street West Assoc, 1976. Magazine. 52p. 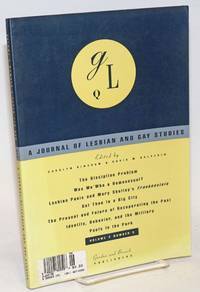 includes covers8.25x10.75 inches, introduction, notes, essay by Kepner, essays, list of Southern California MCC churches, ads for local gay businesses, photos, illustrations, lightly-used souvenir magazine in stapled pictorial wraps. 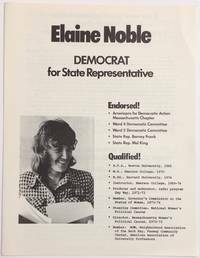 1976 was the year the Association incorporated. 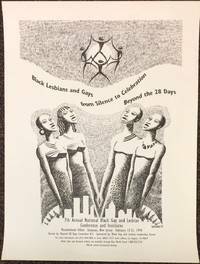 Seventh anniversary of the Stonewall Riots. By Corsaro, Kim, editor, Del Martin, Phyllis Lyons, Charles Rammelkamp, et al. San Francisco: Coming Up!, 1983. Newspaper. 20p., folded tabloid newspaper, illustrated with b&w photos, spot colors, ads, mild toning otherwise very good. 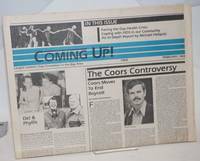 Above the fold story on Del and Phyllis as well as the Coors boycott actions The tabloid began life as San Francisco Bay Times. That paper folded quickly and was reformed as Coming Up! and went through another change adding the original name and eventually dropping the Coming Up! 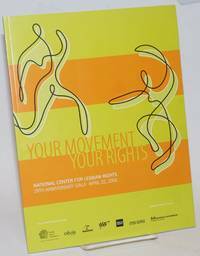 By Corsaro, Kim, editor, Elizabeth Pincus, Alex Dobkin, Larry Beresford, Tim Kingston et al. San Francisco: Coming Up! Inc, 1988. Newspaper. 56p. tabloid newspaper, news, reviews, columns, features, ads, services, resources, calender of events, photos, toning otherwise very good on newsprint. 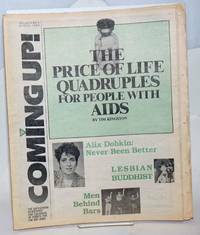 Cover story on the high price of AIDS drugs and treatments The tabloid began life as San Francisco Bay Times. That paper folded quickly and was reformed as Coming Up! After this issue they combined the titles as San Francisco Bay Times: Coming Up! eventually dropping the second name. Secaucus, NJ: the Conference, 1994. 18x24 inch poster, very good. Artwork is by Durham (no first name given). By Corsaro, Kim, editor, Carmen Vazquez, John Mehring, Michael Helquist, et al. San Francisco: Coming Up!, 1983. Newspaper. 16p., folded tabloid newspaper, illustrated with b&w photos, spot colors, ads, mild toning otherwise very good. Above the fold story on the recall vote facing Mayor Feinstein The tabloid began life as San Francisco Bay Times. That paper folded quickly and was reformed as Coming Up! and went through another change adding the original name and eventually dropping the Coming Up! By Corsaro, Kim, editor, Elizabeth Pincus, Larry Beresford, et al. San Francisco: Coming Up! Inc, 1988. Newspaper. 48p. tabloid newspaper, news, reviews, columns, features, ads, services, resources, calender of events, photos, toning otherwise very good on newsprint. 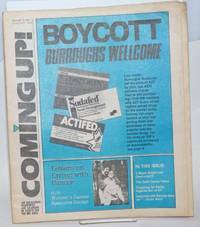 Cover story on the pharma company that made AZT The tabloid began life as San Francisco Bay Times. That paper folded quickly and was reformed as Coming Up! 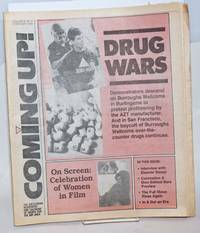 After this issue they combined the titles as San Francisco Bay Times: Coming Up! eventually dropping the second name. By Rosselli, Sal, Virginia Apuzzo, Allan Berube et al. San Francisco: Alice B. Toklas Lesbian/Gay Democratic Club, 1984. Magazine. 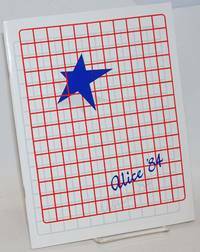 32p., 8.5x11 inches, articles, memorials, biographical sketches, event schedule, membersip and leadership, photos, ads, very good event program booklet in stapled white glossy decorative wraps. By Corsaro, Kim, editor, Elizabeth Pincus, Larry Beresford, Tim Kingston et al. San Francisco: Coming Up! Inc, 1988. Newspaper. 64p. tabloid newspaper, news, reviews, columns, features, ads, services, resources, calender of events, photos, toning otherwise very good on newsprint. Cover story on the pharma company that made AZT. 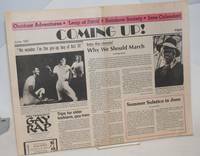 Also a piece on gay activists and Lyndon LaRouche The tabloid began life as San Francisco Bay Times. That paper folded quickly and was reformed as Coming Up! After this issue they combined the titles as San Francisco Bay Times: Coming Up! eventually dropping the second name. By Corsaro, Kim, editor, Linda Wardlaw, Michael Helquist, Aurora Levins Morales, et al. San Francisco: Coming Up!, 1983. Newspaper. 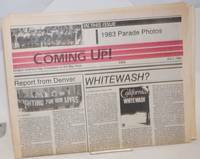 8p., folded tabloid newspaper, illustrated with b&w photos, two pages of photos from the 1983 Pride Parade, spot colors, ads, mild toning otherwise very good. Above the fold story on the cover-up of AIDS victims reporting. The tabloid began life as San Francisco Bay Times. That paper folded quickly and was reformed as Coming Up! and went through another change adding the original name and eventually dropping the Coming Up! 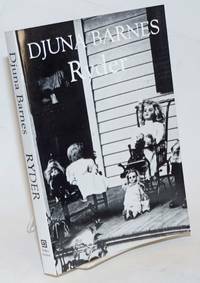 Elmwood Park, IL: Dalkey Archive Press, 1991. Paperback. viii, 250p., foreword, a note on the text and illustrations, afterword, illustrations, very good second printing of this trade paperback reissue in pictorial wraps. By Corsaro, Kim, editor, Alex MacDonald, Cheryl Jones, Dr. Tom Waddell, et al. San Francisco: Coming Up! Inc, 1985. Newspaper. 44p. tabloid newspaper, news, reviews, columns, features, ads, services, resources, calender of events, photos, toning otherwise very good on newsprint. Also a report on the Venceramos Brigade in Cuba. The tabloid began life as San Francisco Bay Times. That paper folded quickly and was reformed as Coming Up! After this issue they combined the titles as San Francisco Bay Times: Coming Up! eventually dropping the second name. 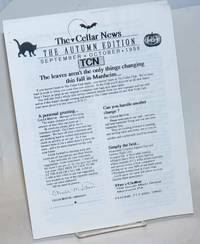 The Cellar News: the Autumn edition, September-October 1998; The leaves aren't the only thing changing this fall in Manheim..
Manheim, PA: The Cellar Club, 1998. 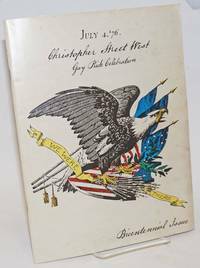 4p., 8.5x11 inches, two sheets with lext and one cover sheet stapled upper-left corner, light wear. Simple newsletter for the Pennsylvania gay & lesbian bar. By Corsaro, Kim, editor, Allan Berube, Cheryl Jones, Dr. Tom Waddell, et al. San Francisco: Coming Up! Inc, 1984. Newspaper. 52p. tabloid newspaper, news, reviews, columns, features, ads, services, resources, calender of events, photos, very good on newsprint. 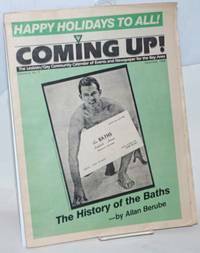 Cover story on the gay baths in San Francisco by Allan Berube. 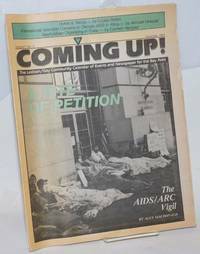 On the closing of the baths due to the AIDS epidemic. The tabloid began life as San Francisco Bay Times. That paper folded quickly and was reformed as Coming Up! After this issue they combined the titles as San Francisco Bay Times: Coming Up! eventually dropping the second name. By Corsaro, Kim, editor, Randy Alfred, Luisah Teish, Roland Shembari, et al. San Francisco: Coming Up! Inc, 1981. Newspaper. 8p. 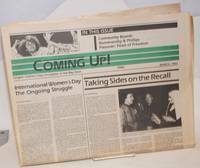 tabloid newspaper, news, reviews, columns, features, ads, services, resources, calender of events, photos, mild toning otherwise very good on newsprint. The above-the-fold story is on Gay Freedom Day. The tabloid began life as San Francisco Bay Times. That paper folded quickly and was reformed as Coming Up! 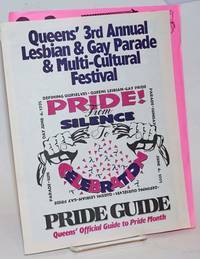 Jackson Heights, Queens, NY: Queen's Lesbian & Gay Pride Committee, 1995. Magazine. 20p. includes covers, 8.25x10.75 inches, event schedule, sponsors, ads, services and resources, pink line of order sheet laid-in, closed teat at spine fold otherwise good program booklet in pastebound newsprint wraps. By Griffith, Blair, Liz Hendrickson et al, editors, Melinda Griffith, Mary Dunlap, Ron Albers et al. San Francisco: BALIF, 1986. 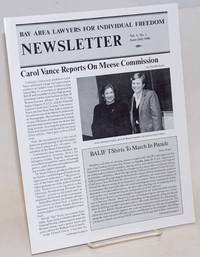 8p., 8.5x11 inches, news, reports, events, services and resources, photos, very good newsletter. Also BALIF T-Shirts to march in Gay Pride Parade. By Corsaro, Kim, editor, David Lamble, Sue Zemel, Carmen Vasquez, et al. San Francisco: Coming Up! Inc, 1982. Newspaper. 12p. tabloid newspaper, news, reviews, columns, features, ads, services, resources, calender of events, photos, mild toning otherwise very good on newsprint. 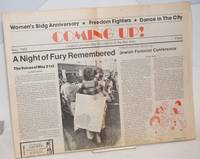 The above-the-fold story is on the 3rd anniversary of the White Night Riot The tabloid began life as San Francisco Bay Times. That paper folded quickly and was reformed as Coming Up! By Dinshaw, Carolyn & David M. Halperin, editors, Lisa Duggan, Will Roscoe, Frann Michel, Kath Weston, Michael Bronski, et al et al. New York: Gordon and Breach, 1995. Paperback. pp179-340., 6.75x9.75 inches, essays, reviews, critical thought, announcements, ads, services and resources, very good paperback journal in yellow and black wraps.